Elon Musk's remarks suggest U.S. sales of costlier versions of the Model 3 are now under pressure, and that it has more work to do before it can profitably sell a $35,000 version in large volumes. Just weeks after Tesla (TSLA - Get Report) shared a deliveries report that suggests many would-be Model 3 buyers are waiting for the anticipated $35,000 version of the car to arrive, the company has delivered an outlook that raises fresh questions about its ability to profitably mass-produce such a car. In an employee e-mail that was published on Tesla's website, Elon Musk said his firm's "preliminary, unaudited results" suggest it made a smaller GAAP profit in Q4 than it did in Q3, when it posted GAAP EPS of $1.75. He also suggested that his company will have a fight on its hands to turn a profit in Q1 -- a seasonally weaker quarter for auto sales, and also one in which U.S. electric car buyers will only get a $3,750 federal tax credit, following a halving of the credit at the end of 2018. Separately, Musk announced that Tesla, which in October disclosed it had 45,000 employees, is laying off about 7% of its workforce to improve its bottom line. He added that the company will still be upping its Model 3 production rate going forward, as well as "making many manufacturing engineering improvements." Tesla's ever-volatile shares fell 12.9% in Friday afternoon trading to $302.58. The drop comes ahead of a Q4 report that's expected to arrive in late January or early February. It's worth noting that going into Friday, Tesla's consensus analyst estimates already called for GAAP EPS to drop to $1.36 in Q4 and $0.43 in Q1. Thus Musk's remarks about Q4 and Q1 profit expectations don't necessarily mean that Tesla will miss analyst estimates. However, following a strong Q3 report in which the company soundly beat profit and cash-flow expectations, many investors were clearly hoping for additional profit growth in the subsequent quarters. Moreover, the tone of Musk's e-mail, together with his remarks about Tesla's need to hit lower price points, have raised worries about how sales of currently-available versions of the Model 3 are trending now that a lot of initial demand for costlier versions of the car has been met, as well as about how soon it can crank out a $35,000 Model 3 -- previously indicated to see deliveries start in February or March -- in large volumes while turning a profit on those volumes. "While we have made great progress, our products are still too expensive for most people," Musk admitted. He also noted that Tesla's Q3 profits were made possible in part by "preferentially selling higher priced Model 3 variants in North America," and that its hopes for a Q1 profit hinge on selling costlier versions of the Model 3 in Europe and Asia (Tesla has previously said European and Chinese Model 3 deliveries will start in February). In addition, Musk points out that a fresh 50% drop in the U.S. EV federal tax credit that arrives in July will up the pressure his company faces to sell cheaper versions of the Model 3. 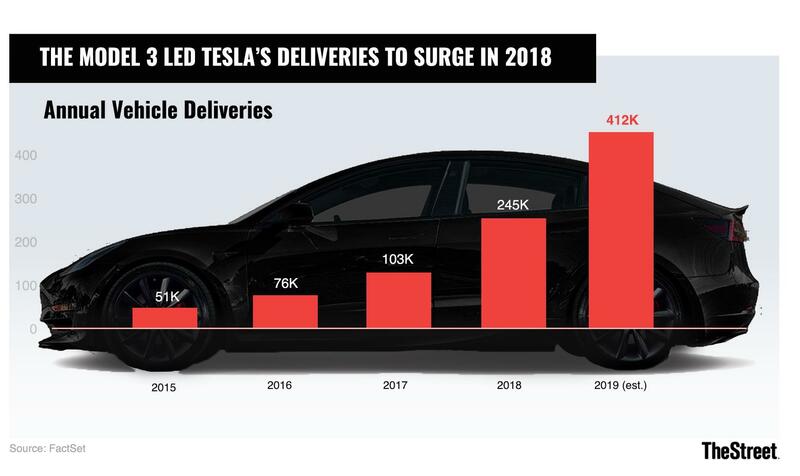 And -- in spite of the prior remarks about starting deliveries in February or March -- that "higher volume and manufacturing design improvements are crucial for Tesla to achieve the economies of scale" to sell a $35,000 Model 3, the version of the car that many of those who once put down $1,000 for a Model 3 reservation clearly want, and "still be a viable company." For now, the cheapest Model 3 on sale is the Mid Range model, which currently sports a $44,000 starting price and features a range of 260 miles. From the time that it launched in October, the Mid Range Model 3 felt to me like a half-measure meant to keep Tesla's margins from collapsing as it tried to reach lower price points. In May of last year, Musk declared his company would "lose money and die" if it started selling a $35,000 "Standard Battery" Model 3, which will have a 220-mile range, right away. On Tesla's October earnings call, Musk admitted Tesla still has more work to do to bring down the production cost for the Standard Battery model, but insisted it would eventually be able to sell the car profitably, while adding that Tesla's goal is to bring the car's all-in production cost below $30,000. In Q3, when Tesla's cheapest Model 3 had a $49,000 starting price, the company reported having a Model 3 gross margin (GM) above 20%. Judging by Musk's latest remarks, Tesla still has a lot of work to do before it can start shipping a $35,000 Model 3 in large volumes while keeping the company's total Model 3 GM close to where it was in Q3. And if -- as signaled by recent delivery numbers and commentary -- U.S. sales of costlier Model 3 versions are coming under pressure now that early demand has been met and the tax credit has dropped -- that makes keeping Model 3 GMs high while mass-producing the $35,000 version all the more challenging. On the bright side, starting deliveries for just the costlier Model 3 variants in Europe and China should provide a meaningful sales boost -- Tesla has previously noted that sales of "mid-sized premium sedans" are higher in Europe than in the U.S., where SUVs and pick-ups account for much of the consumer vehicle market. And the company's success over the course of 2018 at improving Model 3 production and eliminating its previously-massive cash burn (defying fears that it would run out of money by the end of 2018) suggest that its manufacturing and financial execution has gotten better. Moreover, if Tesla manages to start profitably mass-producing a $35,000 Model 3 in the coming months, initial reviews and customer satisfaction ratings for more expensive versions of the car bode well for consumer demand. So does Model 3 reservation activity, and the fact that (per Tesla's trade-in data) many buyers of costlier Model 3 units have been trading in mid-range sedans to obtain one. However, the investor debate surrounding Tesla hasn't simply been about whether it can survive (that's looking pretty likely right now), or whether it can sell cars that consumers want to buy (it clearly can). It has been about whether Tesla, whose 245,000 2018 vehicle deliveries were still a fraction of what the world's biggest automakers achieved, can sell enough cars at a meaningful profit to justify the $50 billion-plus valuation it has been granted. Musk's e-mail -- and in particular, the parts related to producing and selling cheaper versions of the Model 3 -- does give bears a fresh talking point or two for that particular debate.